The U.S. has “successfully intercepted” an intercontinental ballistic missile during the first test of its ground-based intercept system, the U.S. Missile Defense Agency said Tuesday. The test occurred just days after the North Korean regime launched its ninth missile this year. U.S. officials say today’s test had been planned for years. The ground-based interceptor launched from Vandenberg Air Force Base in California shortly after 3:30 p.m. ET. A little more than one hour later, the Pentagon confirmed that it had successfully collided with an ICBM-class target over the Pacific Ocean. 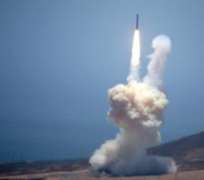 The ICBM-target was launched from the Ronald Reagan Ballistic Missile Defense Test Site on Kwajalein Atoll in the Marshall Islands , 4,200 miles away. “The intercept of a complex, threat-representative ICBM target is an incredible accomplishment for the GMD [Ground-based Missile Defense] system and a critical milestone for this program,” said Missile Defense Agency Director Vice Adm. Jim Syring. “This system is vitally important to the defense of our homeland, and this test demonstrates that we have a capable, credible deterrent against a very real threat. I am incredibly proud of the warfighters who executed this test and who operate this system every day.”The ground-based interceptor system is mainly designed to counter a North Korean missile threat, but a U.S. official said Tuesday’s long-scheduled test was coincidental to North Korea’s increased missile testing this year. This was the 18th test of the ground-based interceptor. The last one, in June 2014, was the first success since 2008. The system was nine for 17 since 1999 with other types of shorter-range target missiles. Tuesday’s ICBM target had never been tested before. There are 32 ground-based interceptors at Fort Greely, Alaska, and four at Vandenberg. The U.S. tests its ICBMs about twice every year. Earlier this month, the Air Force Global Strike Command test-launched an unarmed Minuteman III ICBM equipped with a single test re-entry vehicle from Vandenberg. The re-entry vehicle landed at Kwajalein Atoll. “These test launches verify the accuracy and reliability of the ICBM weapon system, providing valuable data to ensure a continued safe, secure and effective nuclear deterrent,” the Air Force Global Strike Command said in a statement. North Korea has spent the last decade working to develop an ICBM capable of reaching the continental United States. Though North Korea has conducted nine missiles tests in 2017, none have been ICBMs. The ground-based interceptor being tested Tuesday is different from the Terminal High Altitude Area Defense system deployed in South Korea, which is designed to intercept missiles at a lower altitude in their terminal stage. The last test North Korea conducted, on May 28, was assessed as a short-range ballistic missile, which landed in the Sea of Japan, according to U.S. Pacific Command. Two weeks earlier, North Korea tested a KN-17 medium-range ballistic missile, the first successful launch of its kind for the nation. The Japanese Defense Minister Tomomi Inada told reporters that the missile reached an unprecedented altitude of 1,245 miles. Experts said the missile would have flown much farther if it had been launched on a maximum trajectory — perhaps capable of reaching U.S. military bases in Guam .